Earlier this week Israeli Prime Minister Benjamin Netanyahu said his country would be soon taking measures to connect its railway grid with Gulf states via Jordan. 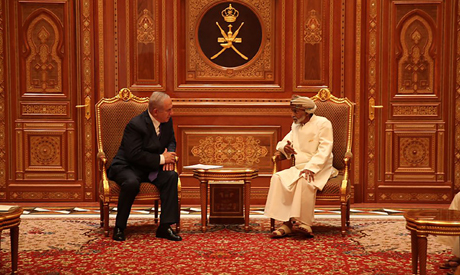 While the proposal is not entirely new — it was the subject of a tentative agreement between Tel Aviv and Amman a little over a year ago — from the point of view of the Palestinians it is a significant announcement, coming in the wake of Netanyahu’s surprise visit to Oman where Sultan Qaboos, who makes few public appearances, extended a cordial welcome. Following the short visit, earlier this week, Natanyahu said it would not be his last to Arab countries with which Israel has no peace treaty. Abdel-Alim Mohamed, an Israeli affairs expert at Al-Ahram Centre for Political and Strategic Studies, says it is no longer possible to ignore that relations between the Gulf states and Israel are being fast-tracked. He points out that what Al-Khalifa and Al-Jubeir said at the Manama Dialogues was in essence an echo of the argument first made in winter 2008 by the then Israeli foreign minister Tzipi Livni — that the dynamic of the Arabs versus Israel was being replaced by one of “moderates” versus “extremists”. Now, he says, Israel has been replaced by Iran as regional enemy number one.